The new GTIII-5R - anyone running one ? 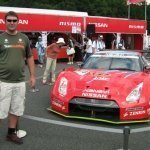 Can't find any info on a Gtr running one or any real world results. Very interested in this turbo. Ok so I take it there is no one running one of these in Australia, I might have to be the Guinea pig then. You'll probably notice a difference, upgrading from. A T51. But for everyone else HKS isn't even on the radar for turbos anymore. All about that no turbo speed sensor life! I run old HKS T51S which is Garrett TA45S based, so I would like a drop in replacement ideally as I have the hks v band inlet/outlet in exhaust housing which seems to be HKS specific sizes - 99.1mm in and 115.5mm out. Precision and Garrett appear not to do these sizes and I want to avoid new manifold and dump pipe fabrication, hence looking into this new offering from HKS. Can get turbo at $3800 and delivered from Japan for a bit under $4k. That seems reasonable compared to Precision and Garrett to me. $4k Fully landed from my Japan contacts, not $4400 from Nengun or 5k like CJ motor. Be a little bit more modifying oil and water lines but will have installed for less than $5k. Yep will post results after installation but will be probably be around May / June as gotta get car 2700km one way to Sydney to tune. That is horrendously expensive for a journal bearing turbo, it can't be compared with Precision or Garrett turbos price wise as you'll be comparing with DBB things. You should be comparing with things like the Borg Warner S300SX-E, Holset turbos etc. I wonder if fatz would approve of this move? FFS stop worrying about the price and banging on about being journal bearing. I already have a journal bearing turbo and can live with it now if I had to as it hits bloody hard already. I'm trying to gauge if this will be a big improvement over what I've already got. Supposed to match T51R Spl BB for response, but I have no 1st hand experience with an Spl. I really did want a PTE 6466 or 6870 but looks like different v band sizes compared to what I've got. Can anyone else confirm if Garrett GTX series or similar has the 99 and 115 v band ex housing sizes, as I'll change to anything that's better than what I've already got if it matches my manifold and dump. If not I guess I will be going the very uncool and gay hks route. Don't bother as I just got off the phone with GCG and they can confirm that the HKS 99.1/115.5mm v band sizes on the exhaust housing are HKS specific. They could modify what I've already got with possibly different wheels and ball bearing core. That said, in their opinion the difference in spool improvement is marginal with ball bearing cores over journal bearing. Increased spool mainly comes from more efficient wheel and housing design than anything else. Don't get me wrong, having ball bearing chra is good but it's not the " be all, end all" of a good turbo. If the new 5r has a more efficient housing and wheel design surely it could still be a good thing. I hope you're using a power FC too, the pinnacle of japanese performance. looks like a colossal waste of time and money to me. this is HKSs own literature.. find a used T51r SPL and stick that on instead if you're chasing a period-correct 1990s power curve. Was just trying to be helpful and I was not making any call about performance, as I don't know what how these perform. I was simply pointing out the fact that manufacturing costs for journal bearing turbos are much lower than ball bearing ones. If you are happy with the fact you are paying the same price (or more) for something HKS are putting much less into than their competitors, then sweet. If the 5R has good design then it definitely could be a good thing, the only info we have is from HKS who are hardly going to say "This isn't really any better than the previous generation but we know people like our name so this should be close enough to justify charging a premium" as part of their marketing. The fact that their comparison is against the T51R-SPL is not setting a high bar these days. Glad you found the info you needed, and again - was just trying to be helpful. Good luck with whatever path you go forward with. If you're after the minimum fuss approach, my best advice is to get someone like Tao from @hyper-gear to fit a new modern, ball bearing CHRA with a modern compressor and modern turbine wheel to your front compressor housing and rear turbine housing. You'll have a performing turbo, that some what "bolts in" and looks JDM as FK yet performs much better than whatever HKS has to offer. Plus you'll have left over coin for a re-tune. I hope﻿ you're using a power﻿﻿﻿﻿ FC too, the pinnacle of japanese﻿﻿ performance. Do I detect a hint of sarcasm ? No power fc is gone and have Haltech elite 2500 with 4 bar map, R35 coilpacks and Ross trigger kit. You realise that HKS curve is not an RB26, but I get that they are overlaying it against a T51R to compare. Lithium, you're probably right about it not being better than a T51R. Like I said I have no idea on how good or bad the T51R is, so I cant comment. I do appreciate everyone's input trying to be helpful as that is why I asked the question on real world RB26 results with this turbo. Dose pipe, that's exactly what I brought up with GCG about possibly doing - it basically becomes a new ball bearing Garrett with the HKS 1.00a/r v band exhaust housing on the back. Anyone know what turbo that you would use for that, that would be compatible with my exhaust housing ? Who is Tao and Hypergear ? You can mill out your compressor and turbine housing to suit larger wheels, etc. Tao from @hyper-gear is based in Victoria and has made countless turbos for Skylines, he sponsors John Richardson's R33 GTS-t (the WTAC car) and I believe the Top Stage S14 as well. I am surprised you have no idea who he is or who Hypergear is. I'm not a fan of GCG's ability to build turbos, they're great at selling off the shelf items however. talk to Tao from @hyper-gear he can mix and match wheels to suit your requirements, GCG pretty much just grab an off the shelf CHRA and mill stuff out to suit.